Soup is an excellent fall lunch. It’s easily transportable and is ideal for brisk fall weather. This split pea soup is hearty and packed full of nutritious vegetables. The recipe combines two recipes from Ina Garten and Emeril Lagasse. I was going to purchases a ham bone, but the little Safeway near my apartment doesn’t carry ham bones. I used cubed pork roast instead. I’m sure roast is a more expensive route, but split pea soup without ham is like a cupcake without icing. I also increased the cooking time, which I strongly suggest. I like split pea soup best when the peas have partially disintegrated into the broth. The ingredients are 1 onion, 2 tablespoons minced garlic, ½ teaspoon red pepper flakes, 1 1/2 teaspoons salt, 1 pound carrots, 1 sweet potato, 1 pound dried split peas, 8 cups chicken broth, 1 ½ pounds pork roast, 1 teaspoon hot sauce. In a pot, I added chopped onions, garlic, crushed red pepper, salt, split peas, cubed pork, and chicken stock. Split peas can be green or yellow. The green color gene is recessive to yellow. The peas naturally split when they are dried and their skins are removed. I brought this to a boil and simmered for 40 minutes. After simmering for 40 minutes, I added the cubed carrots and sweet potato. I continued to simmer for an additional 40 minutes. The last ingredient was hot sauce. This soup is comforting and warming. Despite the red pepper flakes and hot sauce, it isn’t very spice. 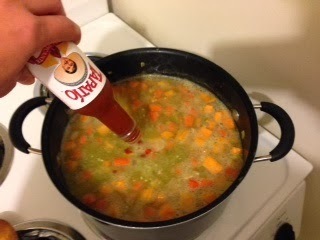 In fact, I added a few squirts of extra hot sauce when I served myself a bowl. The split peas make the broth thick and satisfying. Another perk of this dish is that split peas are inexpensive.